I’m very thrilled to inform you, that finally, after a long wait, my last work, 24 Vocalises by Marco Bordogni for tuba and piano accompaniment is available on Potenza Music Publisher. This is a new edition of an original book dated 1933. 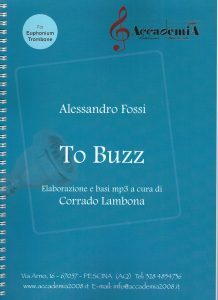 In addition to the book, there is a CD where I recorded (with C tuba) all the vocalises with piano accompaniment, this music is written in operatic style, the purpose of the recording is to give an idea of the possible nuances typical of Italian opera. Furthermore, you can develop your musicality, performing this pieces in Duo with piano also as part of a recital, as I did several times.